looking on. Other Flyer player is Charlesworth. Playing some fine offensive and heads-up defensive basketball, the Igloo VFW team overpowered the Rapid City AFB squad on the latter's home court by a 63 to 49 count. Led by the speedy Three Stars, who tallied 32 points, the VFW team displayed a smooth-working outfit that shows early promise of being one of Igloo's best. The VFW team was organized early in November with competition open to all. After three weeks practice, a squad of 12 men was chosen. The first game with the RCAFB as opponents produced some very fine sportsmanship on both sides and the Airmen congratulated the VFW on their fine mental attitude after the game was over. Igloo VFW - Three Stars, 32; Fuller, 8; Eagle Feather, 10; Cooper, 5; and Richards, 8. RCAFB - Shroger, 16; Frost, 8; Hooper, 6; Nedella, 5; Helsey, 4; Charlesworth, 6; and Green, 4. VFW players seeing action included Jacobs, Badmilk, Morrison, Nickols, Dupree and Jacobs, none of these figuring in the Igloo scoring. In a return game played before a full house, the Igloo VFW team was defeated by the Rapid City Air Force Base quintet at Igloo, Nov. 22. Final score was 57 to 55. The Airmen took an early lead and never were headed after that although the VFW came within one point at one stage of the game and Blacksmith's desperation heave at the final whistle narrowly missed tying the score. RCAFB - Lowry, 10; Shoger, 23; Hooper, 4; Johson, 7; Hansley, 2; Rutan, 9; Schultz, 2; and Dollard, 0. IGLOO VFW - Three stars, 12; Fuller, 9; Eagle Feather, 2; Richards, 12; Blacksmith, 8; Morrison, 2; Dupree, 4; Bad Milk, 0; Nickols, 0; W. Jacobs, 0; and Cooper 6. Many Igloo fans claimed this was one of the better games played here in recent years. 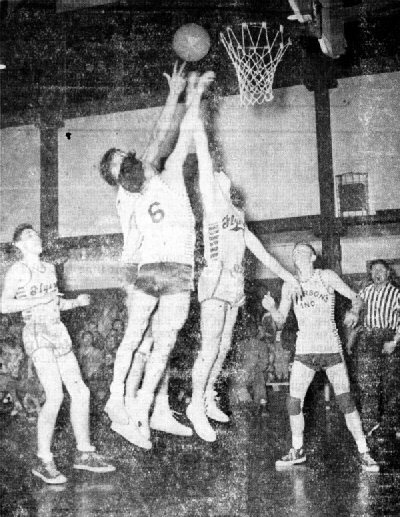 The Flyers were partially able to stop Three Stars, something they couldn't do on their home court where this versatile player counted 32 markers in a VFW win. The Igloo VFW Basketeers have compiled one of the best records in the Tri-State area. Playing hard clean basketball and displaying unusually fine sportsmanship the VFW team has developed into a power house, amassing an enviable record of 12 wins as compared to 2 losses. The VFW team is composed of Fuller, Three Stars, Eagle Feather, Richards, Cooper, Morrison, Johnson, Dupree, Haskell, White Horse, Bad Milk, and Jacobs. The Igloo VFW basketball team won the championship title in the 23rd Annual Tournament held at Harrison, Nebr., last week by defeating the Lance Creek Oilers in the final game Saturday night to the tune of an 81-62 score. Sixteen teams from the tri-state area participated in the tourney which lasted through Wednesday, Thursday, Friday and Saturday. The final contest was played before a packed gym of roaring spectators. The VFW sailed through the Lance Creek aggregation, who had spiked their line-up with three players from the Buckaroos, recent champions of the Vets tourney at Igloo. In the waning minutes Blacksmith led the VFW team in a dazzling display of tricky ball handling that had the crowd howling. In the scoring column, Three Stars led the champs with 20 points, closely pursued by Blacksmith with 17, matched by Wolverton of the losers. Friday afternoon the VFW basketball team weathered the storm to attend the Gold Medal Tourney at Glenrock, Wyo. Igloo played the last meet to set up the eight teams for consolation or championship flight. In what "old-timers" of the tournament called the most thrilling game ever witnessed on that floor, Igloo nosed out the Lander VFW team by a two-point margin, 64-62. In the first period, the rangy Lander five took a ten-point lead. Johnson of Igloo went on a 14-point spree and at halftime, Igloo led the Wyoming team, 30-29. In the last half the lead changed nearly every time the ball changed hands. In the final moments of the game, Jacobs dropped in a basket to take a point lead, then making a free throw on the foul picked up on this last play, he gave Igloo the win by two points. Three Stars led the scoring for Igloo with 22 points. Saturday night Igloo tangled with a fraternity team from the University of Wyoming, losing 88 to 81. The university team led the entire game - the margin ranging from one to nine points. Jacobs, Swallow and Johnson fouled out, leaving Igloo without substitutes for the last five minutes of play. Three Stars acquired a "Charley-Horse" following Friday night's game, and inspite of the heat, exercise and rubbing, could not get in proper condition for Saturday's play. In the finals of the tournament, Wheatland copped the championship, with Lander VFW taking the consolation bracket. Igloo VFW can feel gratified in their showing at the meet in that the team that defeated them eventually won the lower bracket. The Igloo players are very proud of the compliments and support given them by the manager and officials of the tournament, by participating teams, by the people of Glenrock and the spectators of the games. The distinction of being the only out-of-state team invited to the tournament is gratifying in itself. Future games have been scheduled with the Casper Bluebirds and Evans-Nagel team of Casper to be played at Igloo this month, with return games at Casper early in March.